Installing an outdoor goldfish pond is an entertaining and exciting way to add color and vibrancy to your backyard living area and garden. As a matter of fact, outdoor goldfish ponds have been a staple of Asian culture for centuries. Goldfish are distant cousins to the wild carp and are well suited to outdoor living, as they acclimate well to both warm and colder climates. In most areas of the United States, goldfish can even be left in the pond overwinter as long as holes are cut into the surface ice to facilitate proper gas exchange. Plant the pond. Having live plants in your goldfish pond will give the fish something to eat and a place to hide, and facilitate filtration by removing excess nutrients from the water and aiding in aeration. Choose water plants based on the depth in which you want to plant them. Water lilies root deep in the pond water, approximately three feet into the pond, while anacharis floats freely. The surface of your pond should be approximately three quarters covered with plants to prevent excess algae growth. Set up a feeding schedule. 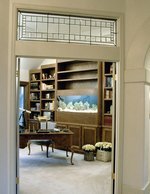 Goldfish should be fed twice daily when the water temperature is above 50 degrees, once daily when it reaches 50 degrees, a couple of times a week until the water temperature reaches 40 degrees and then not at all below that. 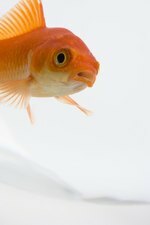 Goldfish should not be fed more than they can eat in less than five minutes. Adhering to this feeding schedule will keep excess nutrients out of the water, preventing algae blooms and keeping the goldfish healthy. Maintain proper water quality. Goldfish are a hardy species of fish and can live in water that is in poor condition. However, they will not thrive in these conditions and can die. Purchase a pond-water testing kit and test your pond water weekly for the presence of ammonia and nitrites, which are byproducts of the fish's metabolism. Both substances are toxic to the fish and must be converted to nitrate in order to support life. If you find that you have high levels of either ammonia or nitrite in your water, adding a beneficial bacteria culture will help speed up the conversion process. You should also test for the presence of chlorine or chloramines, especially after you perform a water change. Tap water should always be treated by adding a chlorine- and chloramines-removing water conditioner to it before introducing fish. Maintain proper goldfish populations. The most important aspect of keeping an outdoor goldfish pond is to make sure you do not overstock the pond. A common mistake of first-time pond keepers is to add too many fish to the pond. You should only keep one goldfish per five gallons of pond water in order to keep your fish healthy.